ExpressVPN Review | Is it The Fastest VPN on Earth? In this ExpressVPN Review, you will find out that Express VPN is an excellent all-in-one service choice. It provides a wide variety of features which is ideal for all VPN customers. It offers performance and doesn’t store logs. Express VPN offers very easy to use VPN software. You can use it on Windows, Linux and OSX operating systems. By using ExpressVPN, you can take advantage of its unlimited server switches in over 137 cities within 87 countries and incredible speed regardless of your location. Express VPN have also built mobile apps which are suitable for both iOS and Android devices; it lets you surf your favorite internet sites while taking care of your online privacy when on the road. Express VPN offers servers in more than 145 cities across 94 countries around the world. You will find Express VPN servers in places like the United States, Canada, Brazil, Peru within the Americas. Within Asia-Pacific, ExpressVPN has servers in Singapore, Japan, Vietnam, Thailand, Australia and New Zealand. In Europe, you can find servers in countries like United Kingdom, Austria, Germany, Latvia, Portugal. Express VPN has servers also in South Africa, Turkey, Kenya, India, Israel within Africa, Middle East & India. These are just a few of the ExpressVPN server locations where you can take advantage of unlimited server switches and ultra-fast connection speeds. To find the latest ExpressVPN servers list, click here. Depending on your requirements, choosing a right VPN server is vital. Often by selecting the nearest server to your location will provide you the fastest connection speeds. However, if you intend unblocking services and streaming videos from another part of the world, then the best way to choose the right server is by conducting a speed test. Express VPN Speed Test application allows to find out which is the fastest VPN server for your specific needs. Speed test is available on Mac, Windows, and Android devices. With the ExpressVPN browser extension, you can easily connect to VPN with only one click and secure your network instantly. Some of the main features that ExpressVPN browser extension offer include internet security, sensitive information protection directly on your web browser, hide your IP address and allows you to bypass internet censorship, firewalls, and other filters. You can use a VPN service to watch Netflix in every location where its service is available. All ExpressVPN servers allow watching Netflix; you just need to select a VPN server from the place where streaming Netflix service is available, and VPN will secure your access. For example, if you intend watching American Netflix outside the USA, then you need to select a US VPN server location. Express VPN has servers in 15 cities within the United States. To find out which is the fastest server location, use the previously mentioned Speed Test feature. Express VPN is compatible with most of the devices and operating systems (OS). 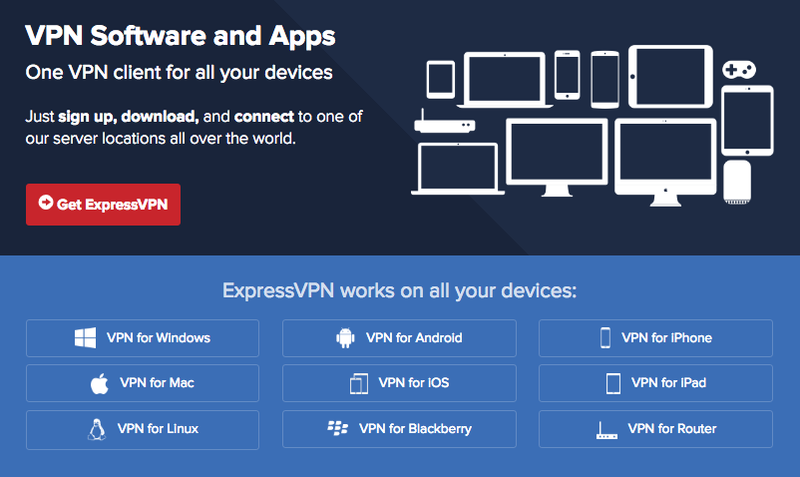 You can download Express VPN for Windows, Mac, and Linux computers. For people always on the go, you can get Express VPN for mobile phones like iPhone, iPad and other iOS devices as well as on Android devices. It is also compatible with Blackberry and several VPN routers. Some of the Express VPN compatible routers include Linksys FlashRouters, Asus, Sabai, D-link, Netduma, TP-Link, and others. The account owner is allowed to have up to three Express VPN simultaneous connections on different devices. How to Download Express VPN? Express VPN software is easy to download and set up. After you have signed up for its account, you will receive a confirmation email. It will consist of your account information that includes your login details. Click on the link provided in the email to log in to your ExpressVPN account, and sign in with your credentials. Once you are logged in, it will bring you to a page where you can to activate Express VPN account. Continue by clicking on to set up Express VPN and choose a device to download VPN software. After you will be required to provide your activation code when installing VPN software on Windows, Mac, and Linux devices. Click to copy your activation code. Express VPN setup is as easy as its downloading. Once you have downloaded VPN software file onto your device, you can go and locate it in your system. 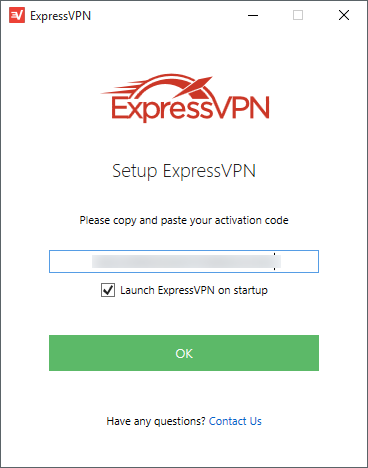 Click on file to install ExpressVPN. Once the installation process is over, you will see a new ExpressVPN icon on your desktop. Click to open the VPN software and paste the activation code that you acquired by logging in to your account. Click “OK,” and you have successfully setup your Express VPN software on your computer. To find out more about Express VPN mobile setup, visit ExpressVPN official website. 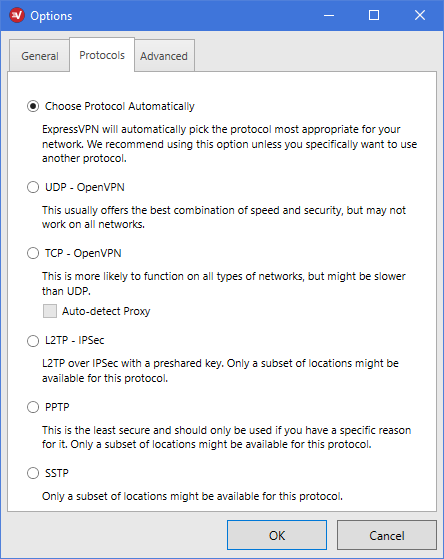 Express VPN provides a superb encryption for its OpenVPN connections. It uses AES-256 cipher with RSA-4096 as well as Hashed Message Authentication Mode (HMAC) in conjunction with the SHA-512. Furthermore, ExpressVPN uses an anonymous key agreement protocol ECDH (Elliptic curve Diffie-Hellman). Express VPN has a very secure setup in place as it produces custom OpenVPN certificate for every user. Also, it requires providing an activation code upon its software launch. All of these features make ExpressVPN extremely safe and secure for its users’ online privacy and anonymity. Express VPN by default chooses and automatically connects to one of the tunneling protocols that better fits for your network. However, you can also change the settings and configure your VPN software or mobile app to use other protocols instead. 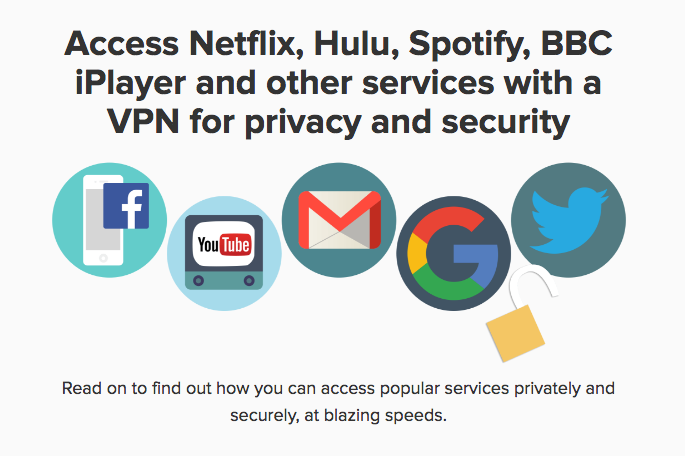 Express VPN is one of the top VPN brands that entirely focuses on its users’ online privacy. For years, ExpressVPN has been providing its users with a software and mobile apps that are easy to use, are fast and provide a private internet browsing without making users worry about data collection and logs. 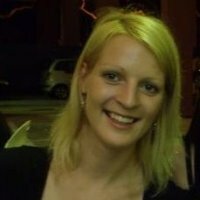 BVI companies have no data retention laws. It doesn’t have other jurisdiction to compel. Therefore it doesn’t have to produce any customer-related records. Express VPN doesn’t offer a standalone SmartDNS package, but you can obtain it with the purchase of its VPN service. ExpressVPN has applications for most of the major operating systems, but currently, for the SmartDNS, it only offers manual setup. Also, not many installation guides are available yet. However, if you are a little bit tech-savvy, you won’t have issues to set it up with a little help from the Google search. One of the major advantages of ExpressVPN SmartDNS feature is that it is currently still in development stage. Therefore it doesn’t require any IP validation, allowing you to use as many devices, locations, and IP addresses as you like. Express VPN clearly highlights that their SmartDNS service doesn’t provide any security and privacy. Hence, use of the VPN service is still necessary to keep your internet identity protected. Another great benefit of SmartDNS is that it can be setup on many other internet-capable devices and not only the ones that can run VPN software. You can configure and use Smart DNS of your smart TVs, Apple and Google TV, Roku and gaming consoles. It also works with US Netflix and BBC iPlayer. However, you may need to switch off certificate warnings on your internet browser to be able to access sites like Netflix. Express VPN recently also added more security and privacy by launching a hidden service Expressobutiolem.onion. 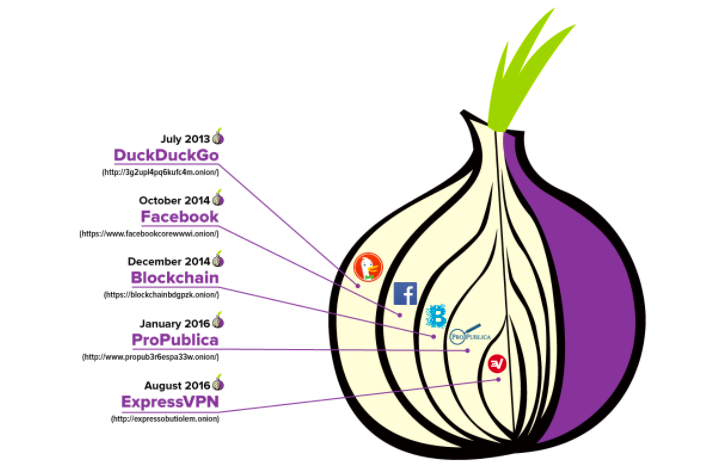 Which means that ExpressVPN hosts an onion service in the TOR network. As a result, it allows its customers to access websites easier, focusing on people living and working in highly censored countries. Plus, it provides extra privacy and anonymity for its current Tor users. You can access ExpressVPN’s .onion site by downloading the Tor Browser from Tor Project official website. It is available for all the key operating systems, including Windows, Mac OS, Linux, and Android. Once downloaded and installed, navigate to the following site http://expressobutiolem.onion and surf the internet easy, safe and even more secure and anonymous. Express VPN created the Tor site because it aims to provide its users with additional anonymity. It also let clients bypass censorship and internet filters. Tor site allows its users to use the Tor network to access content and online services from anywhere in the world and correspond more securely. Tor tool is a great feature that ExpressVPN offer. Fantastic news for people in very censored countries like China and the Middle East. Where without Tor Site it could be troublesome even to access Express VPN website and sign up for its service. While conducting this ExpressVPN review, it had servers in more than 94 countries around the world. Therefore, ExpressVPN is one of the best VPNs to access censored and unblock websites, content, and services from across the globe. Express VPN allows you to stream and watch TV shows, movies, music videos. It lets you access websites and other content offered by the most popular service providers like Netflix, Spotify, Facebook, BBC iPlayer, YouTube, Twitter, See, Wikipedia, Google, Amazon Instant Video, HBO Go, CBC, NBC and much more. Express VPN has done a great job by publishing step by step setup guides for all of these services on its website. ExpressVPN allows torrenting and P2P file sharing. It hides your IP address, provides you with a new IP address and encrypts your traffic, making your online identity anonymous and letting you do file sharing anonymously. However, it doesn’t provide any specific servers for downloading torrents. Express VPN has one of the best customer support team. You can contact them through an online contact form with an average response time being a few hours. Or you can also send an email to support@expressvpn.zendesk.com. But the fastest and easiest way would be to visit ExpressVPN website and start a live chat that is available 24/7 and get an instant response. 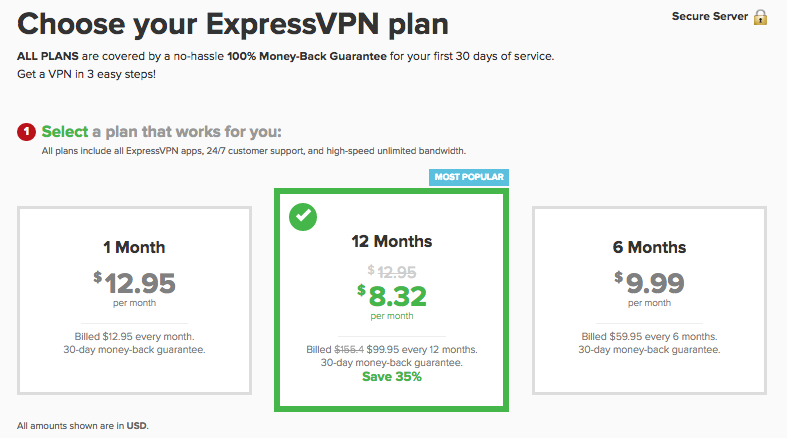 ExpressVPN offers three subscription plans. You can choose from 1 month, six months and 12 months plans. You can choose from three different subscription plans. All plans have the same features. Pick between 1 month, six months or 12 months subscription plans. Get a discount for 6 and 12-month plans. Have no apps for Chromebook, streaming media console and wireless VPN router (however you can use manual configurations). Get Express VPN which provide internet freedom by offering an intuitive and user-friendly app. It allows you to unblock content fast with one tap. The ExpressVPN mobile app also allows you to browse, text and share images privately. But if you aren’t satisfied with the service then you can get your money back within 30 days from the day you sign up. With Express VPN for your smartphone, you can take back your online freedom. Protect yourself from firewalls, censorship and government surveillance. You can also save your metadata from ISPs and hackers as well as any other third party that may be keen to know your online activities. ExpressVPN iOS app is compatible with iOS 7, iOS 8, iOS 9. And you can use ExpressVPN to empower all of the following iOS devices: iPhone (iPhone 4, 5, 5c, 5s, 6, 6 Plus, 7), iPad (iPad 2, mini 2, mini 3, iPad Air, iPad Air 2, Pro, ) and iPod touch. Express VPN Android app is compatible with 4.4 KitKat and Android 5.0 Lollipop. You can use ExpressVPN on following Android phones – Samsung Galaxy Alpha, S6 Edge, Note 4, HTC One Mini 2, M9, Sony Xperia Z3, Compact, Google Nexus 4, 5, 6 and much more Android phones. You can also use Express VPN on Android tablets like Samsung Galaxy Tab S, Note Pro, Sony Experia Z2 Tablet, Google Nexus 7, 9, 10 and many other Android tablets. ExpressVPN creates a secure traffic between the device and the website or application you try to access the internet. Secure traffic allows you to surf the internet and keeping yourself away from bad guys. Works great on my iPhone 6s. I also have ExpressVPN installed on my laptop. Apps are quick to open and really easy to use.